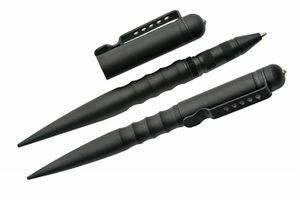 This pen kubaton is 6 inches long and made with solid steel in a black finsh. Looks and writes and is refillable like any ordinary ballpoint ink pen. The top cover screws onto the bottom to maintain a solid instrument of self defense. Besides the tapered end that serves as your striking point, the top of the pen body has a hardened tip to be used as a window or glass breaker. The body is also scalloped to allow you a better grip. The refill is a parker-style. Black Ink. Limited time pricing. This is a new product and is priced at a "get acquainted" level.